Traditional meatballs are usually made with ground beef. Some recipes call for ground beef and ground pork for more flavor. After that, all you need are a few more pantry staples. These ingredients often include: onion, egg, breadcrumbs, milk, salt, pepper, Worcestershire sauce and herbs like parsley. Pro tip: breadcrumbs and milk are essential to making moist meatballs. Mixing these two ingredients together into a paste is called a panade. If you are looking for a leaner option, you can make turkey or chicken meatballs instead by starting with ground turkey or ground chicken. 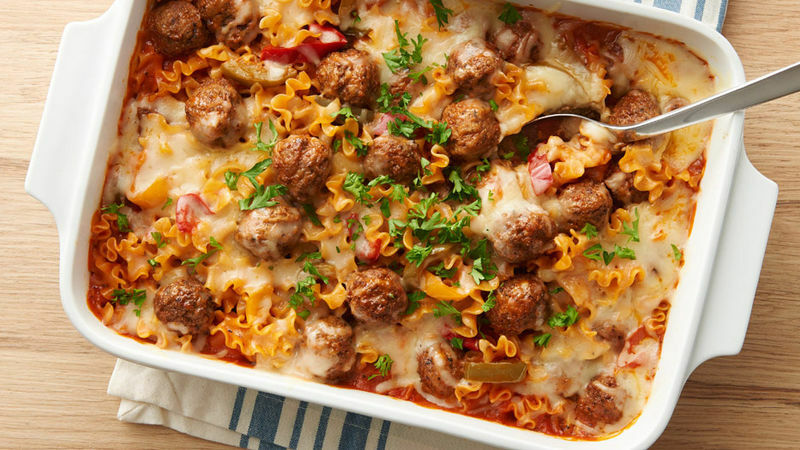 You can cook these meatballs in a skillet or bake them in the oven. To do this, spray a rectangular pan with cooking spray and bake at 400°F for about 20 minutes, or until the meatballs are no longer pink in the center and the thermometer reads 165°F when inserted into the center of the meatballs. Want to learn even more about recipes to make with meatballs and what to do with meatballs when you have some leftover? We have all of the answers to your questions in this article for how to make meatballs.